Features:.Our zero gravity chairs are available in: Black, Blue, Brown, Green, Skyblue, Tan, Burgundy, Pacific Blue and Gray. .Ergonomic deign elevates your legs horizontally which improves blood circulation. .Heavy duty elastic cords enables the material to conform to your body for maximum comfort and support. Our chair positions you so there is no pressure on your spine so your lungs have room to breathe and your legs are raised to lower your blood pressure. Durable mesh 600D PVC material is highly breathable and UV-resistant. Space-saving, foldable design allows for easy storage and set up. Easy-to-use twist knobs effortlessly locks the chair in any position. Our chair features a removable and adjustable headrest which doubles as lumbar support. Curved armrests further provide comfort and support. Convenient cup and accessories holder keeps drinks and handheld items close at hand. Also used by reflexologists, hypnotherapists and psychotherapists to get their patients in a highly relaxed state. Powder-coated steel frame resist rust and weathering. Description: .Specs:. .Fully Reclined Size: 65". .Upright Size: 35.5" x 25.6" x 44.1". .Folded Size: 37.4" x 25.6" x 5.9". .Tube Diameter: 22mm. .Material: 600D UV-Resistant Breathable Mesh. .Weight Limit: 300LBS. .Qty of Chairs: 2 (Pair) .Includes:. .2 x Zero Gravity Reclining Lounge Folding Chair. .2 x Drink/Cellphone Holder. .2 x Removable Headrest. . Features:.Our zero gravity chairs are available in: Black, Blue, Brown, Green, Skyblue, Tan, Burgundy, Pacific Blue and Gray. .Ergonomic deign elevates your legs horizontally which improves blood circulation. .Heavy duty elastic cords enables the material to conform to your body for maximum comfort and support. Our chair positions you so there is no pressure on your spine so your lungs have room to breathe and your legs are raised to lower your blood pressure. Durable mesh 600D PVC material is highly breathable and UV-resistant. Space-saving, foldable design allows for easy storage and set up. Easy-to-use twist knobs effortlessly locks the chair in any position. Our chair features a removable and adjustable headrest which doubles as lumbar support. Curved armrests further provide comfort and support. Convenient cup and accessories holder keeps drinks and handheld items close at hand. Also used by reflexologists, hypnotherapists and psychotherapists to get their patients in a highly relaxed state. Powder-coated steel frame resist rust and weathering. Specs:. .Fully Reclined Size: 65". .Upright Size: 35.5" x 25.6" x 44.1". .Folded Size: 37.4" x 25.6" x 5.9". .Tube Diameter: 22mm. .Material: 600D UV-Resistant Breathable Mesh. .Weight Limit: 300LBS. .Qty of Chairs: 2 (Pair) .Includes:. .2 x Zero Gravity Reclining Lounge Folding Chair. .2 x Drink/Cellphone Holder. .2 x Removable Headrest. .
.This Belleze Oversized Zero Gravity Recliner set of (2) with Detachable Drink Tray offers the ultimate portable comfort. The new and improved locking system allows you to lock these chairs in any position and an adjustable headrest is provided for additional comfort or use as a lumbar support. They're widely used not only as camping, patio, and pool furniture, but in offices. The removable drink tray is great for keeping a beverage at hand. Feature:.Perfect for backyard, beach or sporting events. 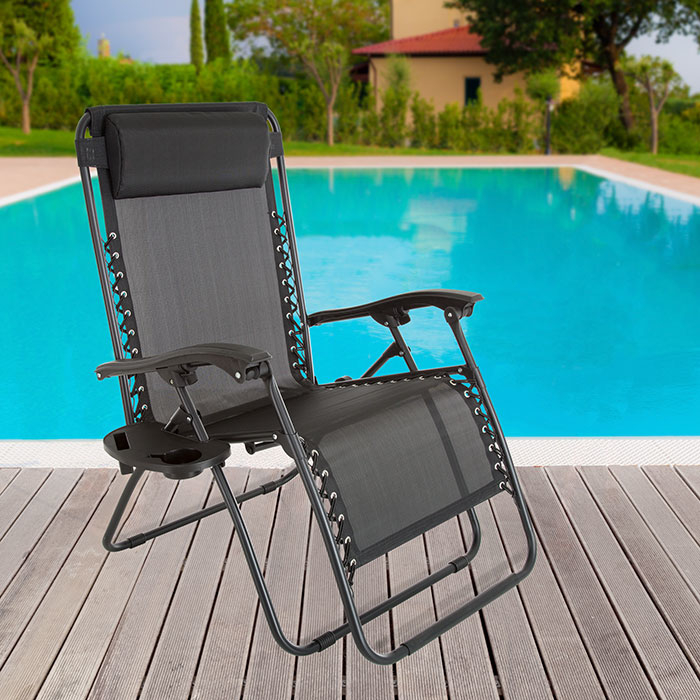 Oversize zero gravity chair is 5"inches wider than the standard model. Heavy duty elastic cords enables the material to conform to your body for maximum comfort and support. Easily glide to recline from upright to the zero gravity position. Durable mesh 600D PVC material is highly breathable and UV-resistant. Chair can be folded to a slim position which can easily be carried and stored away. Smooth relining function that locks in any position dual fingertip locking system.A removable and adjustable headrest which doubles as lumbar support. Curved armrests further provide comfort and support. Detachable cup holder to keep your drinks and phone where you want them. Specifications:.Color: Gray. Frame Color: Brown. Material: 600D UV-Resistant Breathable Mesh. Fully Reclined Size: 62-1/2".Recline Flat: No. Cup Holder Height: 17".Pillow Size: 16"(W) x 9"(H).Armrest: 3-1/4"(W) x 21"(L).Seat Size: 20-1/2"(W) x 19"(L).Backrest Size: 20-1/2"(W) x 28"(H).Folded Size: 31"(W) x 37"(L) x 5 1/4"(H).Overall Dimension: 51"(L) x 37"1/2"(W) x 37"(H).Weight Limit: 300LBS. Package Includes:.2 x Oversize Zero Gravity Lounge.2 x Drink/Cellphone Holder.2 x Removable Headrest. .Belleze Oversized Zero Gravity Recliner with Detachable Drink Tray offers the ultimate portable comfort. The new and improved locking system allows you to lock the chair in any position and an adjustable headrest is provided for additional comfort or use as a lumbar support. The removable drink tray is great for keeping a beverage at hand. Feature:.Perfect for backyard, beach or sporting events. Oversize zero gravity chair is 5" inches wider than the standard model. Heavy duty elastic cords enables the material to conform to your body for maximum comfort and support. Easily glide to recline from upright to the zero gravity position. Durable mesh 600D PVC material is highly breathable and UV-resistant. Chair can be folded to a slim position which can easily be carried and stored away. Smooth relining function that locks in any position dual fingertip locking system.A removable and adjustable headrest which doubles as lumbar support. Curved armrests further provide comfort and support. Also used by reflexologists, hypnotherapists and psychotherapists to get their patients in a highly relaxed state. Detachable cup holder to keep your drinks and phone where you want them. Specifications:.Color: Beige. Frame Color: Brown. Material: 600D UV-Resistant Breathable Mesh. Fully Reclined Size: 62-1/2".Recline Flat: No. Cup Holder Height: 17".Pillow Size: 16"(W) x 9"(H).Armrest: 3-1/4"(W) x 21"(L).Seat Size: 20-1/2"(W) x 19"(L).Backrest Size: 20-1/2"(W) x 28"(H).Folded Size: 31"(W) x 37"(L) x 5-1/4"(H).Overall Dimension: 51"(L) x 37"-1/2"(W) x 37"(H).Weight Limit: 300LBS. Package Includes:.1 x Oversize Zero Gravity Lounge.1 x Drink/Cellphone Holder.1 x Removable Headrest. .Whether you are enjoying an outdoor meal, or your favorite beverage, the Deluxe Zero Gravity Chair with Table is the perfect compliment for any backyard. The wide, durable, table top utilizes a unique bungee suspension system that provides both stability and durability as well as an easy to clean surface. T.Ergonomic deign elevates your legs horizontally which improves blood circulation. Heavy duty elastic cords enables the material to conform to your body for maximum comfort and support. Our chair positions you so there is no pressure on your spine so your lungs have room to breathe and your legs are raised to lower your blood pressure. Space-saving, foldable design allows for easy storage and set up. Easy-to-use Dual finger tip locking system. Our chair features a removable and adjustable headrest which doubles as lumbar support. Curved armrests further provide comfort and support. Folding table with mesh drinks holders. Also used by reflexologists, hypnotherapists and psychotherapists to get their patients in a highly relaxed state. Powder-coated steel frame resist rust and weathering. Specifications:.Color: Navy. Material: 600D UV-Resistant Breathable Mesh. Foldable Table/Chair: Yes. Weight Limit: 300LBS. Armrest Length: 22".Upright Size: 34"(L) x 25-1/2"(W) x 43"(H).Folded Size: 25-1/2"(H) x 6-1/2"(L) x 37"(L).Fully Reclined Size: 62".Seat Size: 16-1/2"(W) x 20"(L).Backrest: 16-1/2"(W) x 30"(H).Table Folded: 20-1/4"(W) x 4"(L) x 26-1/4"(H).Table Dimension: 20-1/4"(W) x 20-1/4"(L) x 20-1/2"(H).Include:.2 x Zero Gravity Reclining Lounge Folding Chair. Foldable Table with Cup Holder.2 x Removable Headrest. .Belleze Oversized Zero Gravity Recliner with Detachable Drink Tray offers the ultimate portable comfort. The new and improved locking system allows you to lock the chair in any position and an adjustable headrest is provided for additional comfort or use as a lumbar support. The removable drink tray is great for keeping a beverage at hand. Feature:.Perfect for backyard, beach or sporting events. Oversize zero gravity chair is 5" inches wider than the standard model. Heavy duty elastic cords enables the material to conform to your body for maximum comfort and support. Easily glide to recline from upright to the zero gravity position. Durable mesh 600D PVC material is highly breathable and UV-resistant. Chair can be folded to a slim position which can easily be carried and stored away. Smooth relining function that locks in any position dual fingertip locking system.A removable and adjustable headrest which doubles as lumbar support. Curved armrests further provide comfort and support. Also used by reflexologists, hypnotherapists and psychotherapists to get their patients in a highly relaxed state. Detachable cup holder to keep your drinks and phone where you want them. Specifications:.Color: Brown. Frame Color: Brown. Material: 600D UV-Resistant Breathable Mesh. Fully Reclined Size: 62-1/2".Recline Flat: No. Cup Holder Height: 17".Pillow Size: 16"(W) x 9"(H).Armrest: 3-1/4"(W) x 21"(L).Seat Size: 20-1/2"(W) x 19"(L).Backrest Size: 20-1/2"(W) x 28"(H).Folded Size: 31"(W) x 37"(L) x 5-1/4"(H).Overall Dimension: 51"(L) x 37"-1/2"(W) x 37"(H).Weight Limit: 300LBS. Package Includes:.1 x Oversize Zero Gravity Lounge.1 x Drink/Cellphone Holder.1 x Removable Headrest. .Belleze Oversized Zero Gravity Recliner with Detachable Drink Tray offers the ultimate portable comfort. The new and improved locking system allows you to lock the chair in any position and an adjustable headrest is provided for additional comfort or use as a lumbar support. The removable drink tray is great for keeping a beverage at hand. Feature:.Perfect for backyard, beach or sporting events. Oversize zero gravity chair is 5" inches wider than the standard model. Heavy duty elastic cords enables the material to conform to your body for maximum comfort and support. Easily glide to recline from upright to the zero gravity position. Durable mesh 600D PVC material is highly breathable and UV-resistant. Chair can be folded to a slim position which can easily be carried and stored away. Smooth relining function that locks in any position dual fingertip locking system.A removable and adjustable headrest which doubles as lumbar support. Curved armrests further provide comfort and support. Also used by reflexologists, hypnotherapists and psychotherapists to get their patients in a highly relaxed state. Detachable cup holder to keep your drinks and phone where you want them. Specifications:.Color: Gray. Frame Color: Brown. Material: 600D UV-Resistant Breathable Mesh. Fully Reclined Size: 62-1/2".Recline Flat: No. Cup Holder Height: 17".Pillow Size: 16"(W) x 9"(H).Armrest: 3-1/4"(W) x 21"(L).Seat Size: 20-1/2"(W) x 19"(L).Backrest Size: 20-1/2"(W) x 28"(H).Folded Size: 31"(W) x 37"(L) x 5-1/4"(H).Overall Dimension: 51"(L) x 37"-1/2"(W) x 37"(H).Weight Limit: 300LBS. Package Includes:.1 x Oversize Zero Gravity Lounge.1 x Drink/Cellphone Holder.1 x Removable Headrest. .Transform any dining space with the elegance and charm of these beautiful dining chairs. Upholstered in a plush and luxurious fabric, these gorgeous chairs feature solid wooden frames that are just as sturdy as they are stylish. The rich color is perfect pair will match all your existing decor with effortless ease. Feature:.Timeless design with hourglass silhouette and scooped backrest, add comfort and style. Give your dining space a sleek, contemporary vibe. High density foam fill for comfortable seating. Gently curved solid wood legs are finished in a complementing modern finish. Beautiful high back, features a stunning design with deep comfort seating. Changing your dining room chair you can transform the entire appearance of the dining room. Contemporary design for adding a modern look to your kitchen or living room. Each seat makes these chairs comfortable and safe for guests. Armless design makes it easy to slide two chairs close to each other during an intimate meal. Tall backs provide extra support during long dinner parties. Sold as a set of 2 matching chairs - elegant, classic upholstered dining room chairs. Specifications:.Color: Red. Type: Parsons Chair. Upholstery Material: Microfiber. Leg Material: Wood. Max Weight: 330lb. Seat Height: 19".Backrest Height: 20".Seat Dimension: 20"(W) x 16"(L).Number of Chair: 2.Overall Dimension: 21-1/2"(W) x 20"(L) x 43"(H).Assembly Required: Yes. Package Include:.2 x Dining Chair. Hardware. Instruction. NOTE:.The digital images we display have the most accurate color possible. However, due to differences in computer monitors, we cannot be responsible for variations in color between the actual product and your screen. .Relax and enjoy the outdoors in this contemporary and comfortable Belleze Zero Gravity chair. Crafted with a canopy and a side tray, this chair lets you lean back in comfort and style while blocked from the glaring sun. The weather-resistant, UV-protected fabric of this stylish chair ensures it lasts for years in your outdoor space while retaining its good looks. Feature:.Ergonomic deign elevates your legs horizontally which improves blood circulation. Adjustable canopy with side tray included - side tray can be put on left or right side of chair. Heavy duty elastic cords enables the material to conform to your body for maximum comfort and support. Easily glide to recline from upright to the zero gravity position. Durable mesh 600D PVC material is highly breathable and UV-resistant. Chair can be folded to a slim position which can easily be carried and stored away. Easy-to-use twist knobs effortlessly locks the chair in any position. Our chair features a removable and adjustable headrest which doubles as lumbar support. Curved armrests further provide comfort and support. Also used by reflexologists, hypnotherapists and psychotherapists to get their patients in a highly relaxed state. Powder-coated steel frame resist rust and weathering. Specifications:.Color: Beige. Frame Color: Brown. Material: 600D UV-Resistant Breathable Mesh. Fully Reclined Size: 56".Recline Flat: No. Cup Holder Height: 17".Pillow Size: 14"(W) x 7"(H).Canopy Size: 20-1/2"(W) x 15"(L).Seat Width: 17".Folded Size: 6-1/2"(L) x 26"(W) x 36-1/2"(H).Overall Dimension: 46"(L) x 26"(W) x 48"(H).Weight Limit: 300LBS. Package Includes:.1 x Zero Gravity Lounge w/ Canopy Chair.1 x Drink/Cellphone Holder.1 x Removable Headrest. .Grab your favorite beverage, and spend the day relaxing by the pool in the this oversized, zero-gravity chair. The chair's adjustable headrest and ability to recline in multiple positions allows you to maximize your level of comfort. Feature:.Ergonomic deign elevates your legs horizontally which improves blood circulation. Adjustable canopy with side tray included - side tray can be put on left or right side of chair. Heavy duty elastic cords enables the material to conform to your body for maximum comfort and support. Adjust the attached sunshade to block direct sunlight, making it easier to see the screen on your mobile device or eliminate the glare radiating from your book. Easily glide to recline from upright to the zero gravity position. Durable mesh 600D PVC material is highly breathable and UV-resistant. Chair can be folded to a slim position which can easily be carried and stored away. Easy-to-use twist knobs effortlessly locks the chair in any position. Our chair features a removable and adjustable headrest which doubles as lumbar support. Curved armrests further provide comfort and support. Powder-coated steel frame resist rust and weathering. Set includes 2 Zero Gravity Chair. Specifications:.Color: Beige. Frame Color: Brown. Material: 600D UV-Resistant Breathable Mesh. Fully Reclined Size: 56".Recline Flat: No. Cup Holder Height: 17".Pillow Size: 14"(W) x 7"(H).Canopy Size: 20-1/2"(W) x 15"(L).Seat Width: 17".Folded Size: 6-1/2"(L) x 26"(W) x 36-1/2"(H).Overall Dimension: 46"(L) x 26"(W) x 48"(H).Weight Limit: 300LBS. Package Includes:.2 x Zero Gravity Lounge w/ Canopy Chair.2 x Drink/Cellphone Holder.2 x Removable Headrest. .This Belleze Oversized Zero Gravity Recliner set of (2) with Detachable Drink Tray offers the ultimate portable comfort. The new and improved locking system allows you to lock these chairs in any position and an adjustable headrest is provided for additional comfort or use as a lumbar support. They're widely used not only as camping, patio, and pool furniture, but in offices. The removable drink tray is great for keeping a beverage at hand. Feature:.Perfect for backyard, beach or sporting events. Oversize zero gravity chair is 5"inches wider than the standard model. Heavy duty elastic cords enables the material to conform to your body for maximum comfort and support. Easily glide to recline from upright to the zero gravity position. Durable mesh 600D PVC material is highly breathable and UV-resistant. Chair can be folded to a slim position which can easily be carried and stored away. Smooth relining function that locks in any position dual fingertip locking system.A removable and adjustable headrest which doubles as lumbar support. Curved armrests further provide comfort and support. Detachable cup holder to keep your drinks and phone where you want them. Specifications:.Color: Beige. Frame Color: Brown. Material: 600D UV-Resistant Breathable Mesh. Fully Reclined Size: 62-1/2".Recline Flat: No. Cup Holder Height: 17".Pillow Size: 16"(W) x 9"(H).Armrest: 3-1/4"(W) x 21"(L).Seat Size: 20-1/2"(W) x 19"(L).Backrest Size: 20-1/2"(W) x 28"(H).Folded Size: 31"(W) x 37"(L) x 5 1/4"(H).Overall Dimension: 51"(L) x 37"1/2"(W) x 37"(H).Weight Limit: 300LBS. Package Includes:.2 x Oversize Zero Gravity Lounge.2 x Drink/Cellphone Holder.2 x Removable Headrest. .Relax and enjoy the outdoors in this contemporary and comfortable Belleze Zero Gravity chair. Crafted with a canopy and a side tray, this chair lets you lean back in comfort and style while blocked from the glaring sun. The weather-resistant, UV-protected fabric of this stylish chair ensures it lasts for years in your outdoor space while retaining its good looks. Feature:.Ergonomic deign elevates your legs horizontally which improves blood circulation. Adjustable canopy with side tray included - side tray can be put on left or right side of chair. Heavy duty elastic cords enables the material to conform to your body for maximum comfort and support. Easily glide to recline from upright to the zero gravity position. Durable mesh 600D PVC material is highly breathable and UV-resistant. Chair can be folded to a slim position which can easily be carried and stored away. Easy-to-use twist knobs effortlessly locks the chair in any position. Our chair features a removable and adjustable headrest which doubles as lumbar support. Curved armrests further provide comfort and support. Also used by reflexologists, hypnotherapists and psychotherapists to get their patients in a highly relaxed state. Powder-coated steel frame resist rust and weathering. Specifications:.Color: Brown. Frame Color: Brown. Material: 600D UV-Resistant Breathable Mesh. Fully Reclined Size: 56".Recline Flat: No. Cup Holder Height: 17".Pillow Size: 14"(W) x 7"(H).Canopy Size: 20-1/2"(W) x 15"(L).Seat Width: 17".Folded Size: 6-1/2"(L) x 26"(W) x 36-1/2"(H).Overall Dimension: 46"(L) x 26"(W) x 48"(H).Weight Limit: 300LBS. Package Includes:.1 x Zero Gravity Lounge w/ Canopy Chair.1 x Drink/Cellphone Holder.1 x Removable Headrest. .Relax and enjoy the outdoors in this contemporary and comfortable Belleze Zero Gravity chair. Crafted with a canopy and a side tray, this chair lets you lean back in comfort and style while blocked from the glaring sun. The weather-resistant, UV-protected fabric of this stylish chair ensures it lasts for years in your outdoor space while retaining its good looks. Feature:.Ergonomic deign elevates your legs horizontally which improves blood circulation. Adjustable canopy with side tray included - side tray can be put on left or right side of chair. Heavy duty elastic cords enables the material to conform to your body for maximum comfort and support. Easily glide to recline from upright to the zero gravity position. Durable mesh 600D PVC material is highly breathable and UV-resistant. Chair can be folded to a slim position which can easily be carried and stored away. Easy-to-use twist knobs effortlessly locks the chair in any position. Our chair features a removable and adjustable headrest which doubles as lumbar support. Curved armrests further provide comfort and support. Also used by reflexologists, hypnotherapists and psychotherapists to get their patients in a highly relaxed state. Powder-coated steel frame resist rust and weathering. Specifications:.Color: Gray. Frame Color: .Material: 600D UV-Resistant Breathable Mesh. Fully Reclined Size: 56".Recline Flat: No. Cup Holder Height: 17".Pillow Size: 14"(W) x 7"(H).Canopy Size: 20-1/2"(W) x 15"(L).Seat Width: 17".Folded Size: 6-1/2"(L) x 26"(W) x 36-1/2"(H).Overall Dimension: 46"(L) x 26"(W) x 48"(H).Weight Limit: 300LBS. Package Includes:.1 x Zero Gravity Lounge w/ Canopy Chair.1 x Drink/Cellphone Holder.1 x Removable Headrest. .Grab your favorite beverage, and spend the day relaxing by the pool in the this oversized, zero-gravity chair. The chair's adjustable headrest and ability to recline in multiple positions allows you to maximize your level of comfort. Feature:.Ergonomic deign elevates your legs horizontally which improves blood circulation. Adjustable canopy with side tray included - side tray can be put on left or right side of chair. Heavy duty elastic cords enables the material to conform to your body for maximum comfort and support. Adjust the attached sunshade to block direct sunlight, making it easier to see the screen on your mobile device or eliminate the glare radiating from your book. Easily glide to recline from upright to the zero gravity position. Durable mesh 600D PVC material is highly breathable and UV-resistant. Chair can be folded to a slim position which can easily be carried and stored away. Easy-to-use twist knobs effortlessly locks the chair in any position. Our chair features a removable and adjustable headrest which doubles as lumbar support. Curved armrests further provide comfort and support. Powder-coated steel frame resist rust and weathering. Set includes 2 Zero Gravity Chair. Specifications:.Color: Brown. Frame Color: Brown. Material: 600D UV-Resistant Breathable Mesh. Fully Reclined Size: 56".Recline Flat: No. Cup Holder Height: 17".Pillow Size: 14"(W) x 7"(H).Canopy Size: 20-1/2"(W) x 15"(L).Seat Width: 17".Folded Size: 6-1/2"(L) x 26"(W) x 36-1/2"(H).Overall Dimension: 46"(L) x 26"(W) x 48"(H).Weight Limit: 300LBS. Package Includes:.2 x Zero Gravity Lounge w/ Canopy Chair.2 x Drink/Cellphone Holder.2 x Removable Headrest. .The sun shade canopy cover steel sling folding chair in Dark Grey features weather-resistant padded headrest, and a high chair back with armrests. Features:.Adjustable Pillow headrest. Clamp Lock Mechanism. Extra Wide Seat. Durable steel frame. Adjustable sunshade canopy. Weather-resistant padded sling. Folds for easy storage. Textilene fabric stands up to outdoor elements. Offers comfortable breathability, and doesn't retain heat. Excellent for a midday nap or some well deserved rest and relaxation. Stay-cool seating surface that won't stick to skin. Perfect for poolside or on a back deck or patio. Wipes clean with a damp cloth. Use alone or with a table for a complete set. Store indoors for prolonged enjoyment. Perfect for keeping the sunshine out of your eyes and keeping cool on a sunny day. Specifications:.Type:. Outdoors. Color/Finish Family:. Dark Grey. Seat Length (Inches):.19.Seat Width (Inches):.17.5.Weight Capacity (lbs. ):.330.Weight (lbs. ):.19.Frame Material: .Metal. Adjustable Back:. No. Manufacturer Color/Finish: . Dark Grey. Primary Material: . Metal. Package Include:.One Folding Chair with Sun Shade and Adjustable Headrest. One Owner's Manual. .The steel sling folding chair in Dark Grey features weather-resistant padded headrest, and a high chair back with armrests. .Features:.Durable steel frame. Weather-resistant padded sling. Clamp Lock Mechanism. Extra Wide Seat. .Folds for easy storage. Fixed Pillow Headrest. Textilene fabric stands up to outdoor elements. Offers comfortable breathability, and doesn't retain heat. Excellent for a midday nap or some well deserved rest and relaxation. Stay-cool seating surface that won't stick to skin. Perfect for poolside or on a back deck or patio. Wipes clean with a damp cloth. Use alone or with a table for a complete set. Store indoors for prolonged enjoyment. Specifications:.Type:. Outdoors. Color/Finish Family:. Dark Grey. Seat Length (Inches):.19.Seat Width (Inches):.17.5.Weight Capacity (lbs. ):.330.Weight (lbs. ):.19.Frame Material: .Metal. Adjustable Back:. No. Manufacturer Color/Finish: . Dark Grey. Primary Material: . Metal. Package Include:.One Folding Chair with Fixed Headrest. One Owner's Manual. Relax in this Oversized Zero Gravity recliner. The chair has a sunshade built into it to protect you from the sun. The removeable drink tray is great for keeping a beverage at hand. The locking mechanism allows for an infinite number of recline positions and a headrest is provided for additional comfort or use as a lumbar support. The recliner folds for easy storage and transportation.